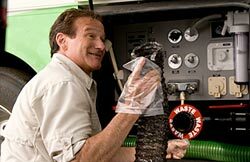 We’ve all had or seen comical mishaps on the road with RV’s, but Robin Williams takes motoring misadventures to new heights of comedy in the movie and DVD, simply called RV. Not since the original 1954 RV classic, The Long, Long Trailer, starring Lucile Ball and Desi Arnaz, has an RV had such a starring role in a movie. 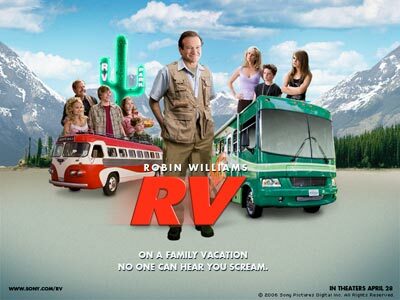 RV premiered at theaters on April 28, 2006, and is currently available on DVD. Robin Williams plays an overworked executive, Bob Munro, who has a business deadline to meet and a classically dysfunctional family to take on vacation. Why not do both at once? Bob cancels their trip to a Hawaiian paradise and instead surprises his wife and children with a "family bonding" cross-country journey in a garishly painted green-and-white rental motorhome, allowing him a chance to secretly attend his business meeting in Colorado. The family sets off on the most dangerous, high-stakes, life-threatening and traumatizing adventure of their lives: two weeks together in an RV. 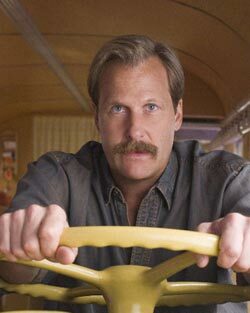 In addition to Williams, RV stars Jeff Daniels (Dumb and Dumber), Cheryl Hines (Curb Your Enthusiasm) and Kristin Chenoweth (The Pink Panther). The film is directed by Barry Sonnenfeld (Men in Black), written by Geoff Rodkey (Daddy Day Care) and produced by Lucy Fisher and Douglas Wick (Stuart Little). 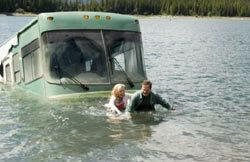 Daniels and Chenoweth play a married couple who are full-time RVers, motoring around the country in a bus conversion motorhome. Daniels plays an annoyingly helpful man who is considered the patron saint of the RV world, while Chenoweth is a part-time businesswoman who sells cosmetics on the road. Click here to see the movie’s website, with additional information, video clips, pictures and games.